This is a great recipe that I make for almost every occasion.Very easy, mixed and baked all in one cake pan which means it uses no bowls for mixing. 2. In an 8 or 9 inch round cake pan mix the flour, sugar, cocoa powder, baking soda and salt with a fork until thoroughly combined. 3. Make three wells in the dry mixture. Pour the oil into one, the vinegar into another and the vanilla into the third. 4. Pour the cold water over all and carefully mix with the fork until thoroughly combined being extra careful to mix at the bottom and around the edges. 5. Place the cake pan in middle of the oven, on the center rack. Bake for 35 to 40 minutes, or until a toothpick inserted in the middle of the cake comes out clean. 7. After 30 to 35 minutes run a knife between the outer edge of the cake and the pan. Turn the pan upside down on a serving plate and tap on the bottom of the pan to remove the cake. Let the cake rest until it has cooled completely. 8. 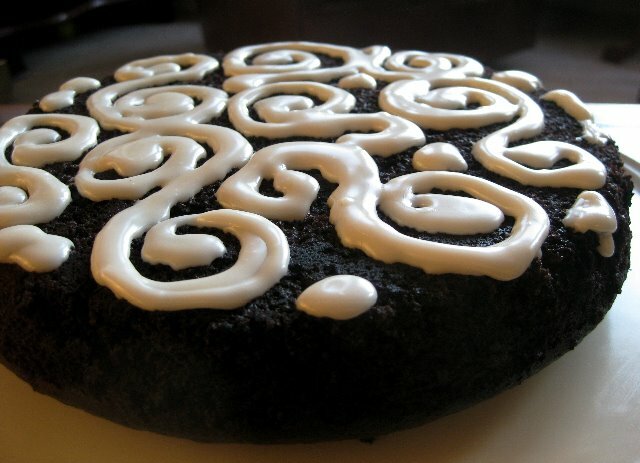 Ice the cake with this easy frosting or sprinkle with powdered sugar. Place ingredients in a quart sized Ziploc bag and seal it. Squeeze the bag until the ingredients are well mixed, about 2 minutes. Trim ¼ inch from a lower corner of the bag and pipe the icing onto the cake in whatever pattern you desire.